Employees work hours on end to contribute to their organization's success — some even compromise sleep, time with their family or friends, and personal activities to complete their work. But is that effort going unnoticed? Unfortunately, it is. In our 2014 Employee Engagement Report, we discovered that a massive 79% of employees don't feel strongly valued for the work they put in. You would think that making an employee feel valued at the workplace is a no-brainer. Frankly, who doesn't want to feel appreciated for their efforts? 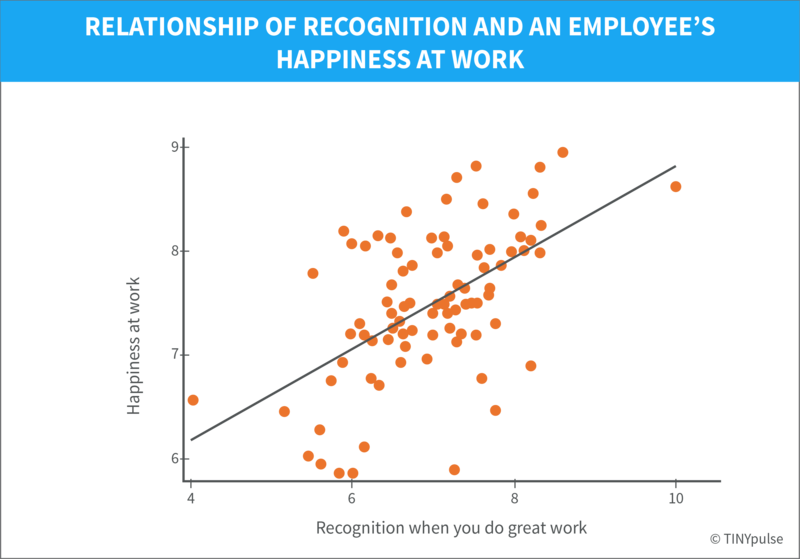 Especially considering the huge impact that recognition has on an employee's intrinsic happiness (r = 0.55). Since employee recognition plays such a vital role in impacting employee happiness, we had to find out what other factors it affects too. Luckily, TINYpulse’s data bank holds a wealth of knowledge. Over 4,500 employees were surveyed around the world to find out how important employee recognition truly is. Retention is tied to recognition: Employees want to work for an organization that not only values their work but also shows them appreciation. We found a strong relationship between recognition and likelihood to stick around at the job. Praise sways the perception of the work environment: No one wants to work at a place that ignores its employees. 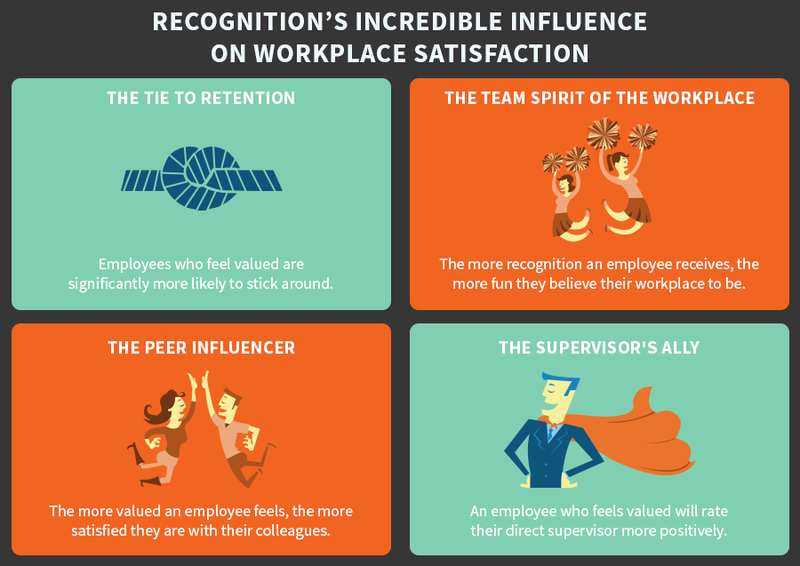 Our research revealed the positive link between recognition and an employee's perception of the workplace. Appreciation improves peer-to-peer relationships: Employees want to recognize their peers. When someone feels valued, they're more likely to rate their colleague with a higher score. Employee-supervisor relationships rely on recognition: The same goes with managers. Employees want to work for someone who appreciates their contributions to the organization, and our research validated that point. When you take into consideration the high cost of turnover and an increasingly improving job market, these findings ought to get you thinking about your own recognition strategies. How can you expect employees to stay at your organization if they're not getting the appreciation they deserve? But of course, if you're ready to commit to dishing out praise, leveraging peer-to-peer recognition tools, creating collaborative spaces, and assessing cultural fit, then you're laying down the right groundwork to retain your star employees. Turnover hurts! The effect of one employee leaving results in a hard hit for your bottom line. But surprisingly, recognition plays a huge role in fighting attrition. 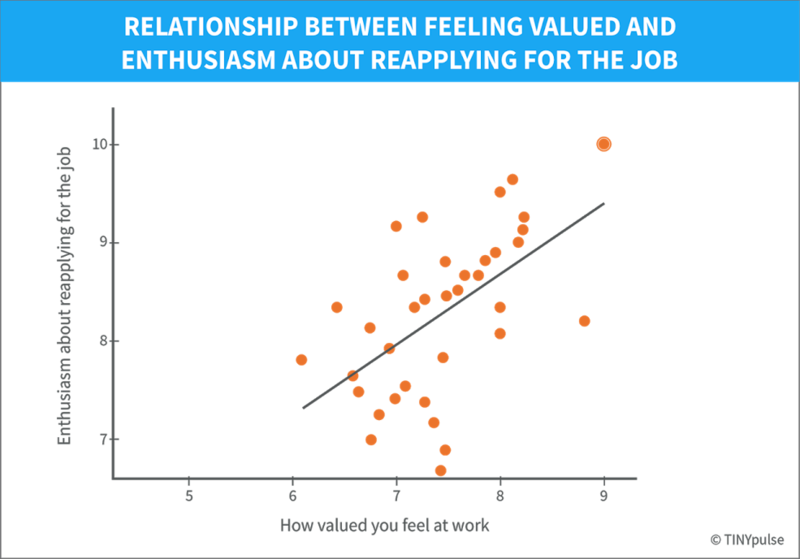 We found a strong relationship (r = 0.56) between how valued an employee feels at work and the likelihood that they would reapply to their job. When it costs that much to replace and ramp up one single worker, imagine the nightmare you’ll face if they start leaving in droves. This is where recognition comes into play. It does wonders for your retention rate and doesn’t even cost you a dime. Consider this: Globoforce found that 55% of workers say they would leave their current jobs for a company that clearly recognizes its employees’ efforts and contributions. By leveraging recognition, you can potentially save over half of your workforce without eating into your budget. The traditional supervisor-subordinate recognition is outdated. That’s why a peer-to-peer recognition tool is the first step in fostering a culture of appreciation. Back in our 2014 Employee Engagement Report, we found that peers, in fact, want to recognize their colleagues if you give them a simple tool to use. Digital accessibility: In today’s digital world, everyone expects their tools to match. Make sure the tool you go with works across all electronic devices — computers, tablets, and smartphones. 24/7 availability: Great deeds can happen any time. Look for a tool that is always available so people can recognize those random acts of kindness on the spot. Shareability: Getting recognized is great, but being able to let others know how hard you’ve worked is even better. Make sure your tool allows you to easily share recognition across your organization. People spend a majority of their waking hours at work. But spending all of those hours in a negative environment can be detrimental to an employee’s happiness, engagement, and work satisfaction. There’s a surprising link between recognition and people’s perception of their work environment. 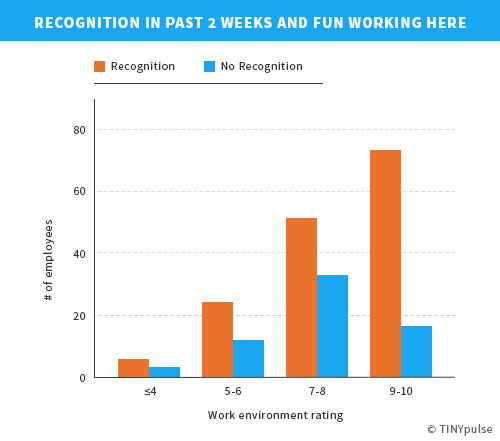 The more recognition they receive, the more fun they believe their workplace to be. When we dug into what people defined as workplace fun, it turned out that it wasn’t all about ping-pong tables and Friday happy hours. There shouldn’t be a clear, distinct line dividing work from fun. In fact, fun is a critical workplace motivator. Badgeville’s survey revealed that 90% of employees find a fun work environment very or extremely motivating. Meeting tables: Scatter these around the office so people can quickly come together. Put up a whiteboard nearby, and you’ve got an impromptu meeting room. These tables are perfect for encouraging and promoting spontaneous ideation. Break rooms: Idle chitchat around the watercooler isn’t a time waster. In fact, it typically revolves around work-related topics, so you never know when a brilliant idea might pop up. Meeting rooms: You can’t leave out rooms that need to be scheduled. These enclosed spaces are ideal for when you need to discuss sensitive topics or gather a large party. As we saw above, peers are the biggest influencers in creating an engaging workforce. When everyone shares the same values and beliefs, they form a culture that functions as a tight-knit community — people support, encourage, and motivate each other. 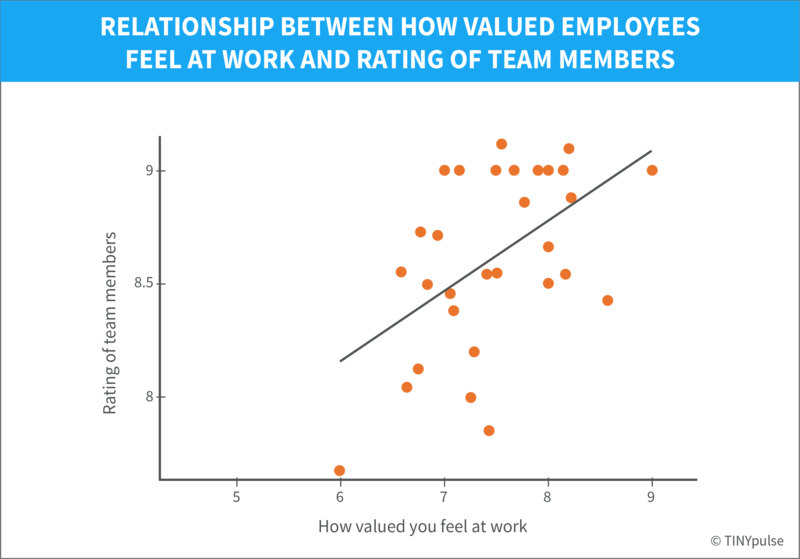 So it’s no surprise that the more valued an employee feels, the higher they rate their colleagues (r = 0.47). So there’s a remarkable cycle that occurs with peer-to-peer recognition. The more recognition an employee receives from their colleagues, the more valued they feel, and the higher they would rate their coworkers because of the initial recognition they received. Our 2014 Employee Engagement Report found that peers, not money, are the number one reason why workers go the extra mile. So when it comes to bringing people on board, you’ll need to consider how well they’ll mesh into your culture. If a candidate can show you they are already living by your company’s values, then you’ll know they are sure to embrace them as part of your team. When you hire someone, they need to understand from the get-go what’s expected from them. And if they don’t fit in with your values, then it’s better for both parties to find out as soon as possible rather than after they’ve accepted the job offer. 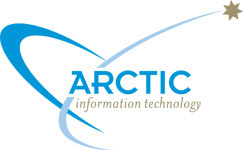 Arctic IT employs a fully distributed workforce, meaning that every employee works remotely across five different time zones. They didn’t have a way of fostering employee happiness, so they turned to TINYpulse to improve retention. Their leadership team recently released a set of core values, and they were aware that the values meant nothing if the employees didn’t embrace them as well. After they were released, the leadership team created a peer-to-peer recognition challenge. Sharon Miller, Senior Recruiter, explains, “We announced the new values with a contest challenge. Employees were encouraged to give each other Cheers and describe how the behavior they were celebrating synced up with one of our values.” Having employees highlight how their peer exemplified their organization’s values was the perfect way to prevent the company’s values from being just meaningless words on the wall. There’s a saying that we hear all too often: “people quit their bosses, not their company.” And it’s very true! People don’t want to work under a boss that doesn’t value their contributions. 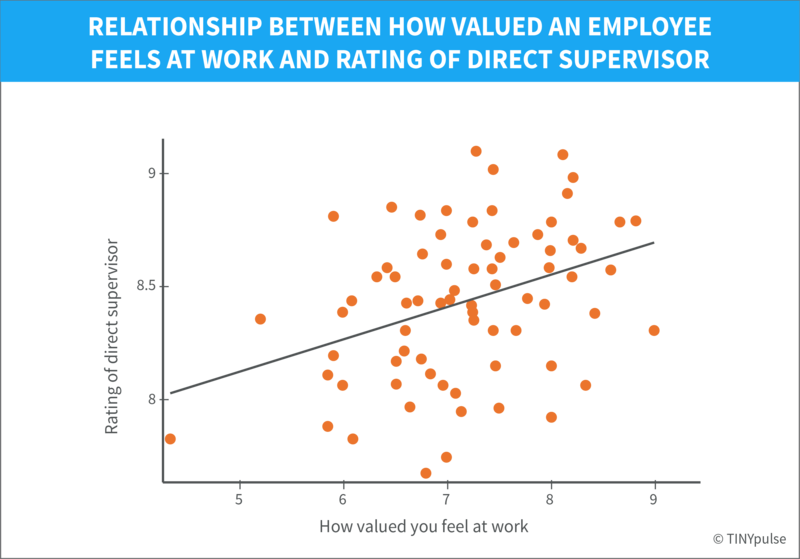 So it’s no wonder that there’s a relationship between how valued an employee feels and how highly they would rate their direct supervisor (r = 0.35). Having a digital tool that’s easily accessible 24/7 allows managers to give recognition right on the spot. And employees don’t have to wait until their performance review to hear how well they’ve been doing. So the more frequent managers give recognition, the more valued an employee feels, thus fostering a relationship where an employee will view their supervisor more highly. Top-notch employees don’t necessarily make top-notch leaders. Great leadership requires someone who not only knows how to spot quality work but can also take charge of the team without stepping on anyone’s toes. So as much as you want to promote your rock star, there are a few factors to consider before jumping the gun. Plenty of praise: As an employee, does this person regularly give their peers a pat on the back or praise them for good work? It’s already evident that employees want frequent recognition, so you’ll want someone who already gives out praise regularly and of their own will. Clear communicator: How do they communicate information to their colleagues? Because employees need clear direction and expectations, they’ll need someone who isn’t afraid to be open about communication in an approachable manner. Motivational mentor: Is this person a Debbie Downer, or are they always willing to lend a hand? You’ll want to promote someone whom your employees can turn to for support at any given time. Skills such as project management and metrics can be learned, but characteristics like “inspirational” and “approachable” are more difficult to pick up. So if your current rock-star employee doesn’t showcase these qualities as a worker, then there’s a good chance they won’t do so as a leader in your organization. Use a peer-to-peer recognition tool: Recognition shouldn’t be solely left up to managers. Organizations today are spread across the globe, and technology allows people to work remotely. Meaning, managers don’t get the chance to see day-to-day activities. Peer-to-peer recognition ensures employees are shown appreciation from their colleagues so they feel valued for their hard work. Create collaboration spaces: Peers have the biggest influence on creating a fun work environment. So draw employees away from their desks by providing them with designated spaces where they can spontaneously get together for ideation. Assess culture fit during interviews: Create a culture where everyone shares similar beliefs by leveraging your organizational values during the hiring process. Tie your values to the interview questions to measure how well a potential candidate will fit into your culture. Promote people with leadership qualities: Before promoting someone from within your organization, you’ll need to assess if they hold leadership qualities that are aligned with your culture. Measure how they recognize, communicate, and mentor their peers as an employee to gauge how well they’ll do as a manager. As the saying goes, Rome wasn’t built in a day, so it will take time to implement some of these changes, such as incorporating peer-to-peer recognition tools and creating collaborative spaces. However, assessing for culture fit for employees and managers is something you can definitely tackle today. Don’t put employee recognition on the back burner. It does wonders for your employee’s happiness and retention rate, driving a massive impact on your bottom line. This study analyzed responses over a 1-year period from over 4,500 employees in 500 organizations across the globe who use the TINYpulse employee engagement survey. Sabrina Son - Employee Engagement Researcher. B.A. in Creative Writing, University of Washington. Companies make an effort to consistently track revenue, financial returns, and productivity. But they're forgetting one of the most important aspects of their organization: their people. And that's where TINYpulse comes in. Founded in 2012, TINYpulse works hard to make employees happy. Our goal is to give leaders a pulse on how engaged or frustrated their employees are, helping managers spark dialogue that results in organizational change. 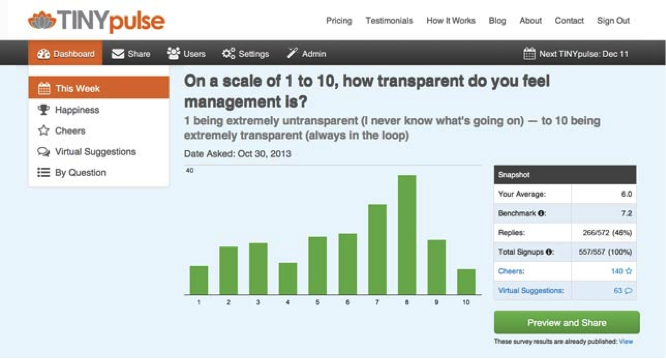 Pulsing surveys: Our weekly pulse survey measures employee engagement using just one question. TINYpulse is a lightweight solution that captures anonymous feedback from your team to reveal insights, trends, and opportunities so you can improve retention, culture, and results. Peer-to-peer recognition: TINYpulse's Cheers for Peers™ peer-to-peer recognition tool captures the appreciation, extra effort, and little things that are often overlooked by leaders. Peers can easily send a quick shout-out to their colleagues to brighten up their day—because a little recognition goes a long way. 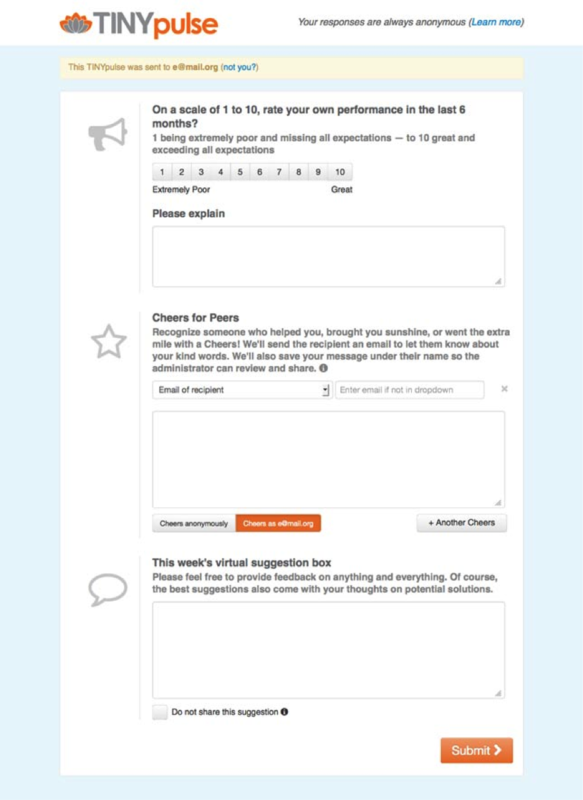 Virtual Suggestions: Our virtual suggestion box lets employees have direct input on how to improve the workplace. The anonymous format makes employees feel comfortable being honest and offering actionable ideas to improve their workplace. Every organization wants happy employees. Our customers range across all industries and all parts of the world, from start-ups to enterprises. Organizations such as GSK, Living Social, Airbnb, HubSpot, Brooks Shoes Apparel, and many more are using TINYpulse to delight their employees and increase engagement.